At a time when the food retail business is controlled by a handful a large chains, independent grocers are few and far between. But that’s only part of what makes Sam Mogannam, founder of San Francisco’s Bi-Rite, a unicorn. The restaurateur-turned-grocer sources local products grown and made by small producers and does about $44 million in revenue out of two retail locations, catering operations, and a creamery (run with his wife Anne Walker) that serves ice cream and baked goods. Despite having more than 300 employees, Mogannam said he pays 100 percent of his staffers’ medical benefits—including part-timers who work 20 or more hours a week. He also offers a 401(k) program that he matches at 4 percent and profit-sharing that ranges from 2 to 6 percent, as well as a host of other benefits including feeding his staff every day and giving them 25 percent off all in-store purchases. Additionally, he hosts training workshops and community cooking classes at a nonprofit called 18 Reasons. That’s the type of uphill climb many independent grocers face these days as they try to provide a livable wage and adequate benefits to employees while selling food made by small-scale farms and artisans. According to the U.S. Department of Agriculture, Americans now spend less of their budget, only 9.9 percent in 2013 compared to 17.5 percent in 1960, on food. As food has gotten cheaper, many independent grocers have found it difficult to compete. That’s part of the reason Mogannam opted to make Bi-Rite a co-sponsor of The Good Food Awards, an annual event that champions producers who are creating and growing responsibly and sustainably made, artisan food and drinks, since its inception in 2010. So he told Sarah Weiner, who co-founded and runs the awards via the Seedling Projects, that he thought stores like his and other independents needed to pool together as the presenting sponsor of the Good Food Awards. “Through the process of talking through it and testing the idea out with a few people, the idea of the collaborative was born,” Mogannam said. The initial idea was two-fold. They would create a network of independent retailers who could sponsor the Good Food Awards collectively as an entity. They would also help to grow the sale of organic and sustainable products by championing the producers and pushing sales in their stores. In January 2015, the retailers collaborative began and has continued financially backing the Good Food Awards, which had 1,927 entries from 48 states and the District of Columbia in 2016—its sixth year of honoring local and artisan producers. 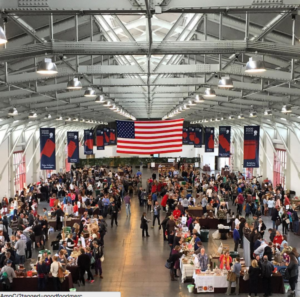 The Good Food Retailers Collaborative now includes 17 retailers from across the nation. Besides Bi-Rite and Canyon Market in San Francisco, the list includes: The Brooklyn Kitchen, The Greene Grape, and Foragers Market in New York City, Glen’s Garden Market in Washington, D.C., Pastoral Artisan Cheese Bread & Wine in Chicago,Zingerman’s in Ann Arbor, Market Hall Foods in Oakland, and SHED in Healdsburg, California, among others. The collaborative has the potential to highlight the many things that set this type of retailers apart. “I had no idea independent retailers worked differently with producers than bigger retailers,” said Weiner. For example, independent retailers are often willing to take smaller profit margins with products from small producers like organic jam and GMO-free pasta than most larger retailers are. The ordering and processing system is also typically more streamlined and easier with an independent retailer. “A lot of producers need that kind of step in order to scale up and make it,” Weiner said. These things make independent grocers an ideal match for the kinds of foods that were being promoted by the awards. These days, there’s a lot of talk about tech incubators, but Mogannam believes that every good retailer can be an incubator too. When a grocer gives prime shelf space to new products made by sustainable makers, it helps increase sales to a producer who is creating non-GMO mayonnaise, organic shallot oil, or a mustard made with sustainably-sourced jalapeños and honey. In turn those producers are often supporting small, independent farmers for another year. “We are trying to drive business to the small retailers so we can continue to support these producers, so there’s more product and more land being farmed well,” Mogannam said. That’s exactly why lawyer-turned-grocer Danielle Vogel of Glen’s Garden Market in Washington, D.C. says one of her company’s core values is growing small businesses along with their own. In the three years since they’ve opened, Vogel says, they’ve helped launch 56 food businesses on their shelves. “In our store we give prime slotting to brands we are trying to incubate and accelerate,” she said. Employees are also encouraged to share the names of three businesses the market has launched during their daily pre-shift meetings that include a “daily recitation” of company values. “Much of our inventory walks through the doors in the arms of the person that made it,” she said. But sometimes the small food producers they work with grow too fast and can’t keep up with the demand without an infusion of cash—a problem that is all too common for small businesses who struggle to get funding from banks. Instead Glen’s Garden Market will barter with a small producer, like Milk Cult, which makes ice cream and ice cream sandwiches, by purchasing equipment so the company can scale up and repay the grocer with inventory of the same value. 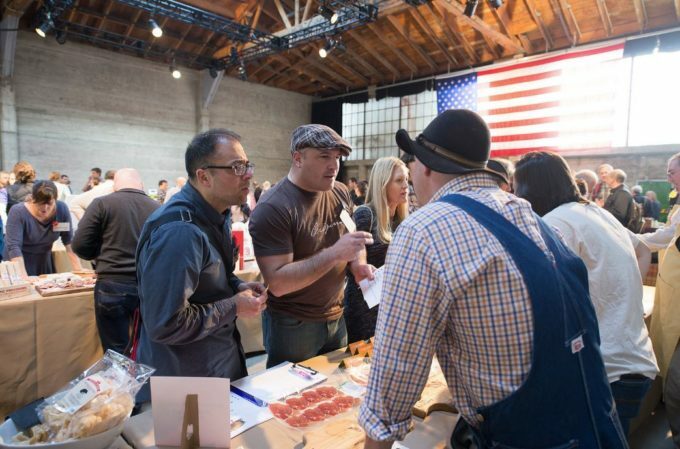 The Good Food Retailers Collaborative came together earlier this month for the Good Food Mercantile—a retail event held in Chicago after this year’s awards, featuring 80 food crafters and a number of the area’s chefs and other food community members. The day after the event, 13 members of the collaborative and a few others huddled up in a four-story Airbnb rental in the city’s West Loop and discussed how they could collectively grow their independent businesses. Danielle Vogel shared that Glen’s Garden Market has an “extensive training process” and couples that with a “robust and quirky set of benefits that are specifically tailored to Millennials.” The laundry list includes sponsoring a women’s racing cycling team and offering a CSA through the company to hourly staff. For $10 a week, staff can receive a two-person share of vegetables or add a pound of locally ranched meat for another $10. “For $20 a week, they are eating like kings, and they are really participating in the best of what we offer, which also makes them brand advocates,” she said. The astronomical housing costs in markets like San Francisco and New York coupled with the business impact of raising the minimum wage have impacted many of the retailers’ ability to retain talent. 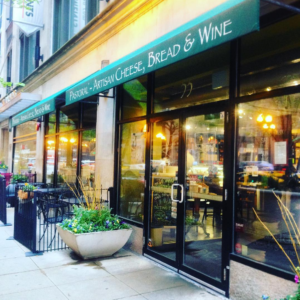 Greg O’Neill, co-owner and COO of Chicago’s Pastoral Enterprises, says being a specialty store requires extra training, which translates into higher labor costs that can’t usually be passed on to consumers. “It’s one of the biggest struggles; you have to make the numbers work,” said O’Neill, who suggests that stores his size give performance-based feedback more frequently and tie an increase in wages to training and knowledge milestones with a “passport approach” and various hurdles to jump along the way. That’s why Hunter Hopcroft of JM Stock Provisions in Richmond, Virginia, said Mogannam sets “the gold standard” by including five extra paid vacation days, career development classes, bonuses for referring new hires, and even personalized birthday cards to every employee. In all these efforts, the collaborative of retailers is trying to compete against convention grocers, and it’s an uphill battle to remain profitable. But Mogannam thinks that small can be mighty, especially when small grocers band together. Photo credits, from top: Gamma 9, Samantha Putman, Kassie Borreson. Dawn Reiss is an award-winning Chicago-based journalist and a member of the American Society of Journalists and Authors. Her work has appeared in a variety of publications including TIME, U.S. News & World Report, Time.com, USA Today, The Atlantic, Reuters, Travel + Leisure, Plate magazine and Chicago Tribune. Find her on Twitter @dawnreiss orwww.dawnreiss.com.